Building the Great Wall of China 2 is rated 3.5 out of 5 by 33. Rated 5 out of 5 by Cabri3 from Get the Collectors' Edition This is one of the few building games I enjoy. While I don't usually like Collectors' Editions (they normally are an inferior addition to the storyline, and not worth paying twice as much to get 25% more), with this I'd recommend getting it if you can. Big Fish doesn't carry it, for some reason, so you'll have to look elsewhere, but it's worth it. Your challenge is to build the Wall in spite of dragons, bad weather conditions, and the necessity of accumulating supplies and food. You can plan several steps ahead, which is a nice feature. Also, you can choose which upgrades to buy, so you can tailor it to your strategy preferences. The only bad thing is that the awards are based on the CE, so if you get the standard version you won't get them all. Myself, I just ignore that, as though it was a glitch, since I know I've gotten all that are doable. If you like this I'd recommend Pirate Chronicles CE by the same company. Arr! Rated 5 out of 5 by volfan37132 from Fun Time Management Game Gather food, lumber, stone, gold and coal to build the Great Wall of China. Rated 5 out of 5 by Chigirl78 from Just the sequel I've been waiting for! I have love playing the original, so I was excited to see that a sequel came out. There have been some good upgrades to the graphics and game play. I bought it after just playing 2 levels. Super fun. Rated 5 out of 5 by just_my_thoughts from A Top Time Management Game This game certainly is an upgrade in graphics, sound and story line compared to its first release. It also has some new features which put the player more on the plan-ahead management role. Most importantly, based on the earned incentives during the game progress the player has to decide which buildings can be upgraded to what level. This is crucial for finishing the rounds in best time. So, the player has to think about which buildings are most important for basic supply (such as wood and stones, whereas food is less important since there are also alternatives like pumpkins etc. available), and what buildings have a general impact on the overall earnings and speed (such as storage building, home base for man power, the building for saving supplies for the next level, or the building for power ups). If the upgrade priority has been done right, the game plays smoothly without time problems. As a matter of fact, I found this game easier to play than the first release and would have wished to be somewhat harder to accomplish the 3 stars as the game progresses. If there is one point for improvements, I would suggest that the building upgrade priorities can be recessed so that the player can make adjustments according to the learning curve. I actually do not like hidden object or action games, both of which are included in the game and cannot be skipped. However, they are easily manageable and did not take away from the overall experience of the game. Rated 5 out of 5 by sambone from Liked the first one love this one It gives a little history. It is not real challenging but enough to keep my interest. I finished with 3 stars in each level. Had to replay a few but all the more fun. Much better than the first one. You build your quarry, sawmill, coal mine, ect. You have to go pick up your supplies to either up grade or build with. You can build a storage to gather more goods. 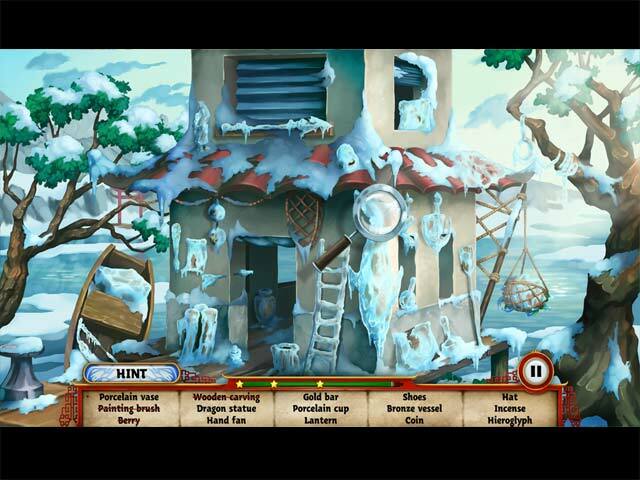 There is an interesting feature too you can carry over a few of your supplies to the next level.The hidden object mini games were ok a little annoying at times but interesting enough. This is a TM game and different than the builder games I don't really care for. Give it a try. Hope they make more like this. Rated 5 out of 5 by gmac1007 from Fun To Play And Gorgeous To Look At This is a really cool building game. Yes you do the basic building as any other building game but this one does throw in some different things. You have your normal buildings like the sawmill, farm, stone mines and gold mines but with this one you also build a fort to protect your buildings because there will be some nasty Nomads and Wizards coming in to destroy what they can so the fort comes in handy. You get to play a mini game when this happens unless you don't have the fort built then you have to repair what is damaged. The graphics are gorgeous and the buildings are really cool looking also there are some hidden object scenes as well when you get ready to go to another place. It has two modes of play normal and relaxed. The game can be challenging and it does take some planning on some levels. The music is definitely fitting and the little worker dudes are really cute I love watching them scoot around. With this one your upgrades don't come automatically you have to buy them with the money you've earned by playing the level, this is something I've never seen before with one of these games and I find it to be rather cool. 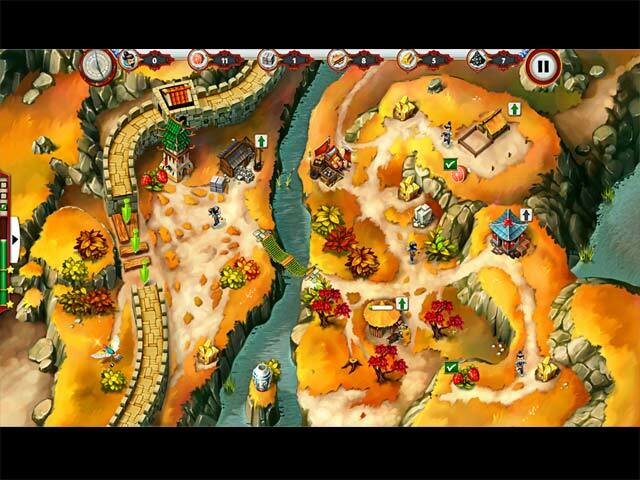 Also there are fun history facts about China before each level and they are really cool. All in all this is a really great little game that offers lots of fun and challenges with some different things thrown in and plenty of eye candy. I'm very glad I purchased this game I haven't got very far but I am having a blast with it. This is the second game of the series I have the first one as well and really enjoyed it. Give the demo a try it's really worth it. Thank you dev's for a great little builder and I hope to see more from you like this and thank you Big Fish for another time management game. Have fun everybody. Rated 5 out of 5 by MistressVo from Fun Time Management Game I played the first game in this series and it was fun as well. It has mini-games in addition to the usual time management piece and rewards you with gold coins for meeting certain goals, e.g. collecting 20 pumpkins in 2 minutes. You also earn gold coins based on overall level performance and you can then use the gold coins to purchase building upgrades between levels. The tutorial isn't to hand-holding and you can turn it off, although it's helpful for pointing out useful features of new buildings. I completely recommend this game for all time management fans. Rated 5 out of 5 by brimaz from WELCOME BACK! 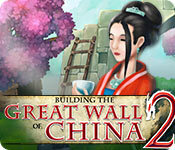 SO good to have a new Great Wall game. This one is basically the same as the original, but with interesting additions - nomads who'll destroy your buildings unless you fight them off, HOGs, and you earn coins to pay for upgrades. Love it! Rated 5 out of 5 by twtscat48 from Fun and Cute TM Game!! I have the first Building the Great Wall of China. 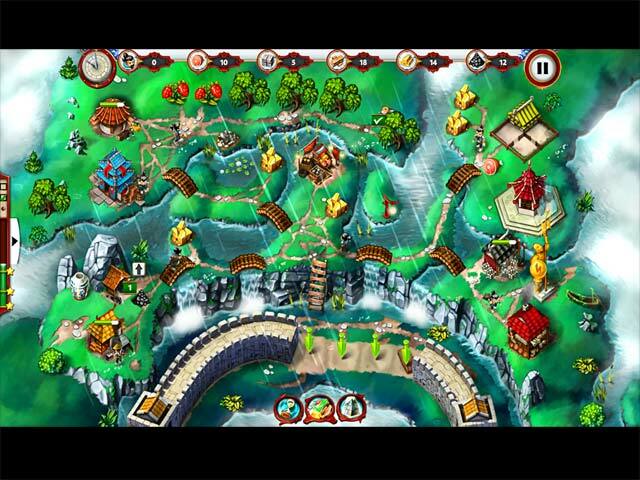 This one has the same cute characters and interesting and fun game play. Like the previous version you collect resources to be able to build the wall. It's very enjoyable. I bought this game as well. I definitely recommend this game!! !